Foraging for wild ingredients grown locally is now an established feature of the international gastronomic world led by the world famous Copenhagen restaurant Noma and others. Great to see that the foraging ethos has jumped from table to bar and even better to see that one of our favourite gins, Caorunn, is leading the way. Caorunn, a small batch Scottish gin created from Celtic botanicals, has recently embarked on a global initiative that will build awareness of the brand’s unique crafting process and highlight the importance of the local, foraged ingredients that make Caorunn Gin so special. In cities across the United States Forage to Glass will highlight the use of locally foraged ingredients to express flavor and a sense of place in the glass.On its first outing, Chicago-area bar chefs and mixologists gathered in Lincoln Park with local foraging expert Chris Mayor to forage local edibles for gin-based cocktails. The harvested herbs and botanicals included wild spicebush, bergamot and several varieties of mint, were then incorporated into a range of cocktails that truly reflects the Windy City. Caorunn’s gin master, Simon Buley—an avid locavore—was on hand to provide technical insight on the gin’s production. The artisanal spirit is produced in a distillery in the far north of Scotland using natural resources with traditional gin botanicals such as juniper and coriander alongside locally found wild rowan berry, coul blush apple, dandelion, myrtle and Scottish heather in one of the world’s only three Copper Berry Chambers. Watch out for key Forage to Glass events across the US with a particular highlight being next week’s Tales of the Cocktail in New Orleans see here for programme details. Meanwhile, back in Blighty, Forage to Glass kicks off in Manchester on the 9th July. Guided by urban forager David Winnward, top Manchester mixologists will be briefed on sustainable foraging and foraging laws, before harvesting a variety of herbs and botanicals including rowan berry and bog myrtle, all key to Caorunn Gin’s complex flavour. Mixologists will also have the chance to forage seasonal delicacies including barberry, mugwort and raspberry ensuring they have enough local edibles to prepare their gin-based cocktails. 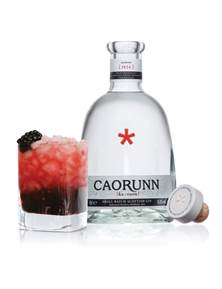 The day concludes in Manchester, at 22RedBank, where David Barber, Caorunn Gin’s Brand Ambassador will invite bartenders to experiment with the versatility of Caorunn Gin and create their own range of unique cocktails that reflect their newly foraged botanicals.